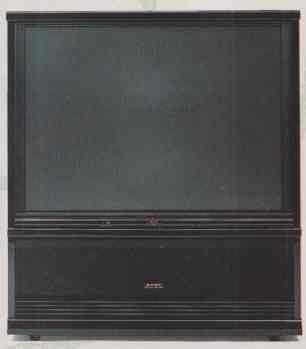 COMBINING high-quality video with high-quality audio was the hot concept of the Eighties in home entertainment. It brought us big-screen stereo television sets, hi-fi VCR’s, laser videodiscs with digital soundtracks, Dolby Surround, and other innovations that created an entirely new level of sophistication among buyers and users of audio/ video electronic equipment. But while a no-holds-barred home theater System with Dolby Pro Logic, five speakers and a subwoofer, multiple amplifiers, and a huge projection monitor is truly something to behold and to hear, not all of us can afford such a luxurious setup, even if we have the space for it or the time to install and calibrate it properly. And since most homes today have several TV sets, what becomes of the audio element in those secondary rooms graced by a television alone? The challenge of the Nineties, clearly, is to transform that fundamental icon of American life, the TV set, into a high- quality audio source without the help of a roomful of auxiliary components and speakers. ---The four-channel sound system in the 46-inch Magnavox RL8544 projection i is made by JBL. Dolby Pro Logic heads the list of features. Price: $3,095. --- Pioneer’s PRO-93 50-inch projection tv ($4,400) offers three listening modes: theater, music, and simulated stereo (for mono programs). Its 10- watt-per-channel amplifier drives a pair of two-way speakers below the screen. There are three kV inputs on the rear panel and one on the front. 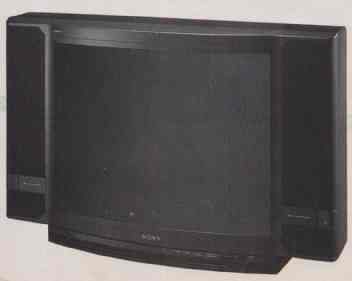 --- The Hughes Sound Retrieval System brings expanded stereo imaging to Sony’s 32-inch Trinitron KV-32HSR10 monitor receiver ($2,300). It has three sets of standard inputs and one S-video input. For most of the appliance’s 50-year history, the typical TV set’s sound System consisted of a single 3-inch oval speaker powered by an amplifier boasting an output of perhaps 2 or 3 watts. Adequate, maybe, for reproducing Topo Gigio on the Ed Sullivan Show. But—as few of us realized at the time—hardly up to the task set by John Lennon’s primal screams in Twist and Shout on the same program. MTV, PBS, A&E, HBO, and Bravo have changed all that. The TV set in the den is as likely to be playing music videos, or opera, at substantial volume as it is to be quietly presenting The MacNeil/Lehrer News- Hour. In response to these new demands, many video manufacturers have scrapped their old audio ways in favor of bigger loudspeaker drivers, more powerful amplifiers, advanced “spatial” circuitry, and clever packaging to hold everything together in one good-looking box. The process has been driven largely by the fact that video sound itself has reached surprisingly high levels of quality. On the broadcast side, the advent of MTS stereo TV has raised production standards for sound enormously. The audio quality of The Tonight Show, say, puts many a live-recording CD to shame. Mean while, hi-fi videotapes and laserdisc digital soundtracks can deliver superb audio for both cinematic and music programming. Any integrated TV sound system must overcome two major hurdles, however. First, incorporating speakers of adequate size and quality within the tight confines of table-top—and even console-style—TV’s is no mean feat. Second, with stereo TV nearly universal, finding a way to create a realistic stereo image for listeners seated throughout the viewing area becomes an imperative. This task is further complicated by the fact that speakers mounted on either side of the screen are by nature doomed to be too close together for unimpaired stereo imaging. As a result, several different systems to manipulate stereo presentation and coverage have sprung into being. Since none of these considerations has a great deal to do with video technology, it’s no surprise that some of the leading TV makers have entered into partnerships with well-known audio-oriented firms—a move that makes the marriage of audio and video a commercial as well as technological nuptial. Among the first to tie the knot was Zenith, one of the oldest names in American television, and loudspeaker juggernaut Bose. 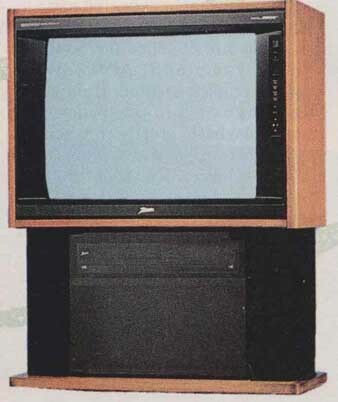 The offspring—first seen and heard in 1986—were Zenith’s “Sound by Bose” TV’S. These sets are available in a variety of sizes and shapes, and the line has evolved into two distinctly different families. The original Zenith/Bose concept was to use a single bass driver mounted midway within a serpentine enclosure, called an Acoustic Waveguide. The result was unusually strong and deep bass from an extraordinarily compact package. The current incarnation of the Acoustic Wave design is exemplified by Zenith’s ZB2792S System 3, a 27-inch tabletop set ($1,295). The bass system, powered by a dedicated amplifier, is at the back of the set, and a pair of 2 1/2-inch “twiddler” drivers—combined midrange and tweeter units—are in the lower front corners. At only 23 x 26½ x 20 inches, the set is a model of packaging efficiency made possible both by the Acoustic Wave technology and by the limited space required for the twiddlers. The set also incorporates advanced video features such as picture-in-picture (pip) processing and on-screen menus for operation and adjustment. Acoustimass home hi-fi speakers. 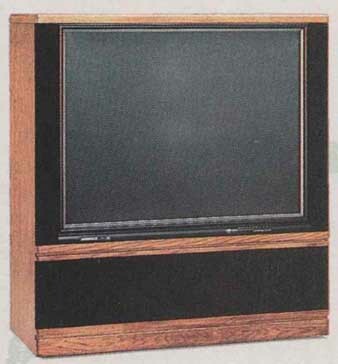 The Zenith/Bose Acoustimass TV sets have a low-frequency driver placed be tween two internal chambers of different volumes, each of which incorporates a rear-facing tube by which it radiates sound into the room. The balance of the system—twin twiddlers and three amplifiers—is similar to the Acoustic Wave design. The Acoustimass system has a wider dynamic range and more powerful bass than the Acoustic Wave system, but it also takes a bit more space. 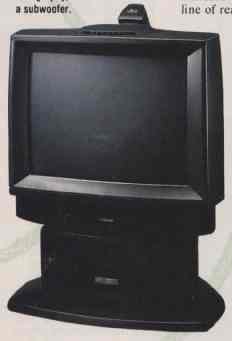 So it is found in bigger Zenith/Bose models such as the $3,295 ZB4685T, a 46-inch rear-projection set. All of the Zenith/Bose tv’s also incorporate Dolby Surround de coding circuitry that can be used by adding optional surround speakers. Another interesting union of expertise is that of Toshiba and Carver. Toshiba is known for high-performance video technology, Carver for innovative audio engineering, especially its Sonic Holography circuit, the technological cornerstone of the Toshiba/Carver partnership. The “Sonic Hologram” generator was first introduced by Carver in audio components back in the late Seventies. It’s an analog processor designed to cancel erroneous directional cues introduced in trying to reproduce a realistic sonic image with only two speakers—a phenomenon sometimes called interaural crosstalk. At its best, Sonic Holography produces a startling illusion that you’re hearing a real, three-dimensional sound source instead of just a pair of speakers. A refined and updated version of Sonic Holography is now found in several Toshiba TV’s bearing the Su per Carver logo. Super Carver sound combines Sonic Holography with a dipole surround-sound speaker comprising two drivers mounted in opposition, one of which is wired in reversed polarity. According to Toshiba, the dipole surround module can be located either behind the TV itself or toward the back of the room. In either case, it’s said to work in conjunction with the Sonic Holography circuits to pro vide enveloping ambient sound. The system incorporates what Carver calls a Precognition Matrix/Vocal Zoom circuit, which is said to enhance stereo spread while simultaneously improving the intelligibility of dialogue. It works by varying the balance of stereo-difference to mono signal components, giving the mono information precedence whenever the dialogue is foremost. The highest-tech Toshiba/Carver model is unquestionably the CX3298K (about $3,200), a futuristic-looking 32- inch direct-view set. In addition to the Super Carver system, the CX3298K includes a stereo speaker array—Sonic Holography optimized—powered by a substantial (for a tv set), 10-watt- per-channel amplifier. A subwoofer, driven by its own 20-watt amplifier, is built into the console’s base. A 10-watt surround-amplifier section is also on board. Interestingly, the set’s wireless remote control can command the stereo speakers to adjust their aim, toeing them in more or less to fine-tune the hologram effect for a particular listening/viewing position. (The entire TV set also swivels in response to remote commands.) Other features include twin-tuner PIP processing, on-screen menu-based control of both video and audio elements, and high-resolution video reproduction. A fascinating and complex effort at integrated TV sound comes from Sony and a somewhat unexpected partner— Hughes Aircraft. Hughes developed an audio circuit called the Sound Retrieval System (SRS). At root, SRS is a rather complex method of processing that aims to restore lost spatial cues to stereo playback, greatly enhancing the stereo image in terms of width, depth, and even height. It is said to work by correcting for errors introduced by standard stereo recording techniques in three major areas of aural location: in the lower frequencies, relative left- right phase; in the midrange, relative intensity; and at high frequencies, relative delay. SRS processing also includes extensive frequency-response shaping of both the difference (L — R and R — L) and mono (L + R) components of a stereo signal. The goal is to re-create the real-world response- shaping effects of both the inner and outer parts of the human ear, which affect the way we localize sounds. The result is a system that can make closely spaced speakers produce a stereo sound field that appears to be much wider—a natural for television, where built-in speakers can’t help being inadequately separated. The effect is said to be quite dramatic regardless of the listener/viewer location, which means that a large seating area is open to optimum performance. Sony offers the SRS system on a bewildering variety of models, ranging from 27-inch standard Trinitrons to its Videoscope line of rear-projection TV’S, including the 53-inch KPR-53EX20 ($3,600). Among Sony’s latest models is the KV-32XBR50 ($2,700), the newest member of the firm’s high-end XBR line. This 32-inch direct-view set features a new version of SRS that’s said to work effectively on mono programs as well as stereo ones. The KV-32XBR50 also incorporates side-mounted swing-out or detachable stereo speakers driven by a 5-watt-per- channel amplifier and a single top-mounted 4-inch woofer powered by its own 20-watt amp. The side speakers cover the range from 180 to 20,000 HZ, the woofer from 180 down to 70 HZ. The set has plenty of unusual video features, too, led by a “fuzzy-logic” picture- control system. Better yet, it comes with two remote controllers: a full- featured, zillion-button programmable unit and a slick, simple, credit-card- size mini-remote that operates the basic functions only. (Which one do you think most families will use?). It is hardly surprising to find the JBL name somewhere in the integrated-television-sound arena. Among the oldest names in loudspeakers, JBL is collaborating with Magnavox to pro duce TV sets with the highest power and most drivers available. A case in point is the 100-watt JBL audio system found in Magnavox’s premier rear-projection set, the 52-inch RL8568 ($3,995). This behemoth incorporates a six-speaker tri-amplified sound system: 1-inch titanium- dome tweeters and 4-inch acoustic- suspension midrange drivers are bi-amplified with 20 watts per driver, per channel; dual 8-inch long-throw woofers are driven by their own 20- watt-per-channel amp; and a two- channel, 10-watt-per-channel amp is built in for the supplied outboard 6V inch full-range surround speakers. Claimed system response is an impressive 39 to 27,000HZ. --- Toshiba’s 32-inch Super CarverCX3298K ($3,200) has 10 watts per channel, Sonic Holography, and a subwoofer. --- Zenith’s 27-inch ZB2741T ($1,400) features a Bose Acoustic Wave sound system, digital audio processing, and Dolby Surround outputs. The Magnavox/JBL system incorporates cleverly implemented Dolby Pro Logic surround circuitry. On its own, the system uses its on-board speakers for the left and right front channels and a “phantom” center channel. But when the set is patched into an existing hi-fi system with component speakers, these become the left/right front pair while the built-ins are used for a discrete center channel. Smart. The same 100-watt JBL sound system is also found in a 46-inch Magnavox projection set, and “junior,” 50-watt, six-speaker and four-speaker versions are available in a multitude of Magnavox/JBL sets. Not all TV sound refinements have been the result of cooperative efforts. Pioneer, for one, has chosen to go it alone in its latest flagship models, the video wing of the firm’s Elite line of no-compromise products. The new $4,400 Elite PRO-93 is a 50-inch tv; the 46-inch PRO-73 is $4,100. Both feature Pioneer’s Dynamic Sound Expansion (DSE) System, yet another audio processor that is said to extend the width of the stereo image while enhancing its detail and depth. Pioneer’s DSE circuitry per forms multistage phase shifting on multiple audio bands, processing these dynamically according to pro gram content. The resulting sound is available in three distinct modes: Theater, Music, and Simulated Stereo (for enhancement of mono sources). The Elite monitors’ audio delivery system includes front-facing two-way loud speakers powered by a 10-watt-per-channel amplifier. Clearly, TV sound reproduction has come a great distance in the past decade or so. Although none of the systems we’ve described is likely to take the place—for pure music listening— of a well-planned, dedicated hi-fi System, it’s interesting to note that many of the sets do provide inputs for out board audio components. In theory, you could simply buy one of these TV’s, add a CD player or tuner, and be done with it. Right now, this approach would be unlikely to satisfy serious music lovers or hi-fi fans. But at the dizzying pace that integrated television sound is evolving, the day may not be so far off when many people will consider doing exactly that.